For me, this was the cake I had on my 16th birthday. It was the cake to have. Many pleasant childhood memories. Thanks Gene! 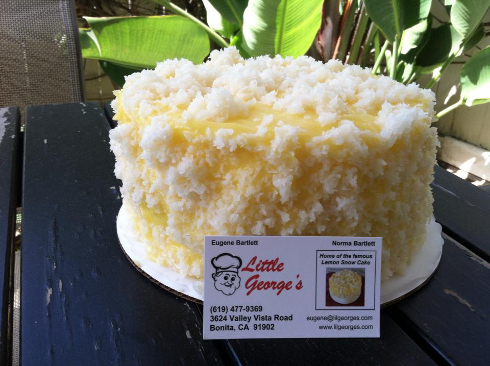 This is just a note of clarification regarding the new “Little George’s” Bakery (Formerly George’s Wonderful World of Cakes in National City). Please read carefully. Gene Bartlett is the longtime owner and baker. He is ONLY making Lemon Snow Cake ($15), Brownies ($10 dozen), and Strawberry Pie ($12). The new place is very small and at this time does not have plans to make anything else. He is using the finest quality ingredients and the master recipes from the old bakery. He has over 50 years of experience and each item tastes as wonderful as you will remember! This is not a storefront business. If you are interested in the Lemon Snow Cake, Brownies, or Strawberry pies, you must call ahead and make an order at (619) 477-9369. The new bakery is in Bonita, but I will not post the address here as it is in a residential area. When you call to make your order, Mr. Bartlett will give you the time and address for pick up. As before, George’s is closed on Saturdays. We are currently working on a web site with online ordering through PayPal. At this time he is ONLY doing local orders, no shipping out or deliveries. Sorry. I can’t ship directly to you. If you use a fake email address, It’s impossible to respond. I live out-of-state. Hint: try calling them at the phone number given on the card above.